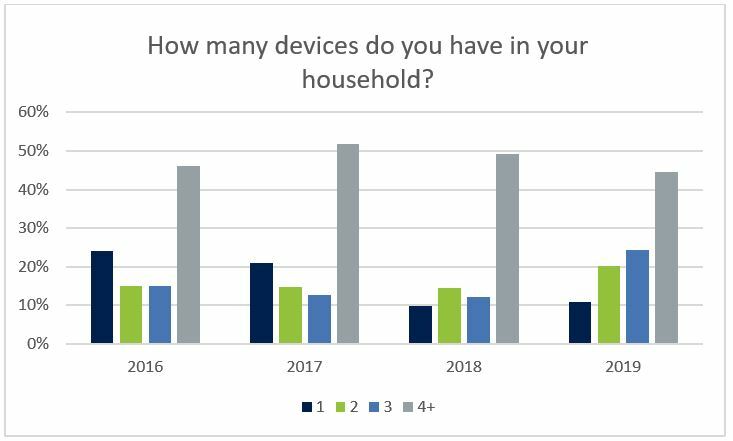 Since 2016, consumers have consistently reported having four or more devices in their household, in all cases at least doubling the number of households with fewer laptops, desktops, smartphones, and tablets. This year, 45.5 percent of respondents claimed four or more devices. While that’s lower than past years, it doesn’t necessarily mean users are relying on fewer devices. In fact, the percentage of respondents with two devices went up by 6 percent over previous years and the percentage of those with three devices doubled – from 12.2 percent to 24.4 percent. The bottom line is that multi-device households are still the standard, which means they have even more points of data access they must protect. 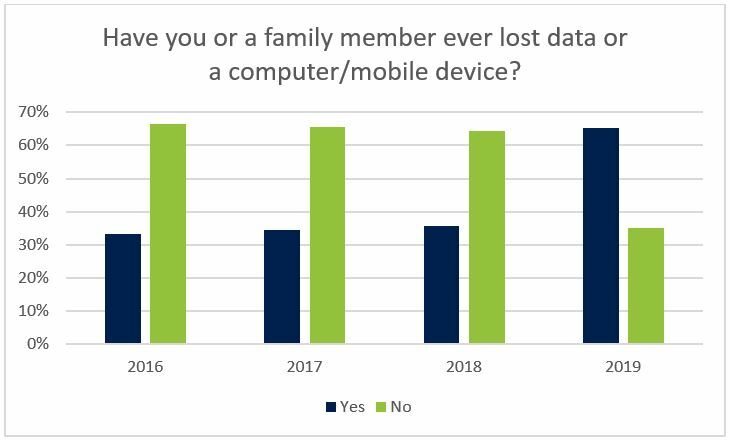 In a shocking about-face, 65.1 percent of respondents this year reported that they or someone in their family had experienced data loss. This is almost the exact opposite of responses in all three prior surveys. Given the rapid increase in malware attacks, the amount of time people spend on their devices, and how portable these devices are, this year’s dramatic increase seems more understandable. Users have more data, more places to access and store that data, and therefore more opportunities to loss data by accidental deletion, cyberattack, or simply a lost or stolen device. Regardless of how many people actually lost data, the type of data they would be upset about losing remains consistent. 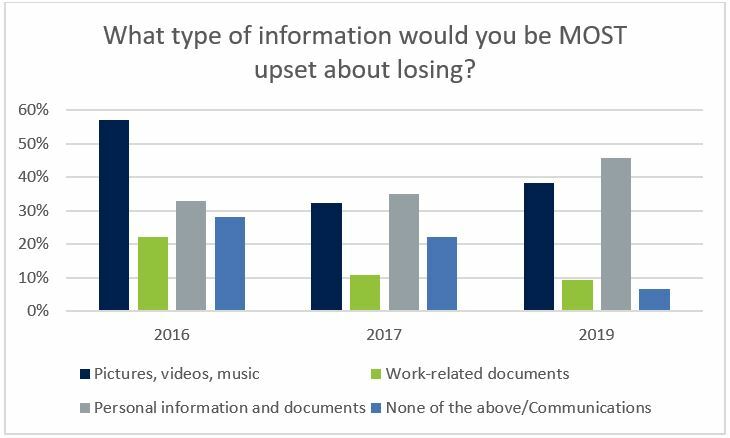 While music, photos, and videos remain one of the top types of data they don’t want to lose, personal information (including passwords and contact lists) have continued their rise in importance since 2017. This suggests that personal technology users are increasingly aware of the dangers that threaten their personal data. Given the many high-profile examples of data breaches, this trend shows a global growth in awareness – a very positive sign that people are starting to pay more attention to their info online. In an exciting first, our 2019 survey saw a precipitous drop in the number of users who never back up their devices. Between 2018 and 2019, the percentage of those who never backed up fell from 31.4 percent to its lowest point ever: 7.3 percent. 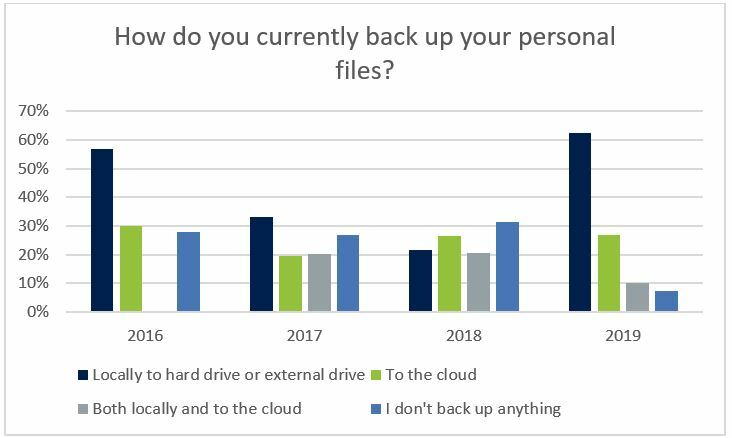 Unfortunately, this year also saw the lowest-ever percentage of respondents (10.3 percent) who use hybrid backups, which involves storing a copy of their backup locally and another one off-site in the cloud. That strategy is a key component of 3-2-1 rule of backup, the gold standard of data protection. 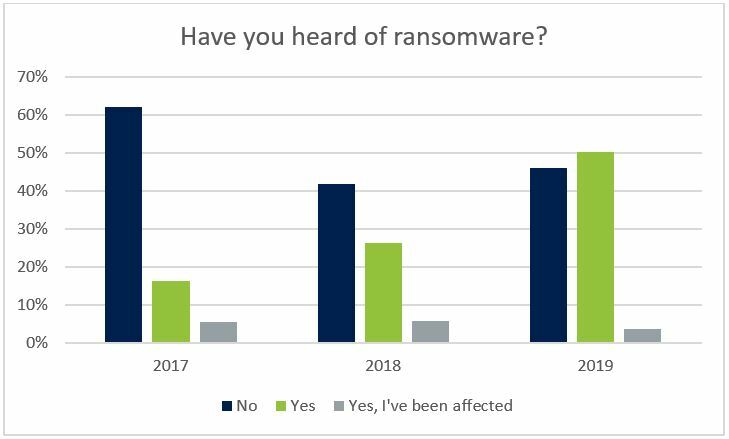 Despite an increase in the number of attacks and enhanced educational efforts, ransomware remains a mystery to nearly half of our survey respondents. While this year saw 50.2 percent of respondents claiming awareness of the threat of ransomware and another 3.8 percent reporting they had been affected by an attack, the number of respondents unfamiliar with the threat illustrates a persistent issue. That could be a key part of why data loss is such a common occurrence since you won’t take steps to keep your data safe from a threat if you don’t know about that threat. 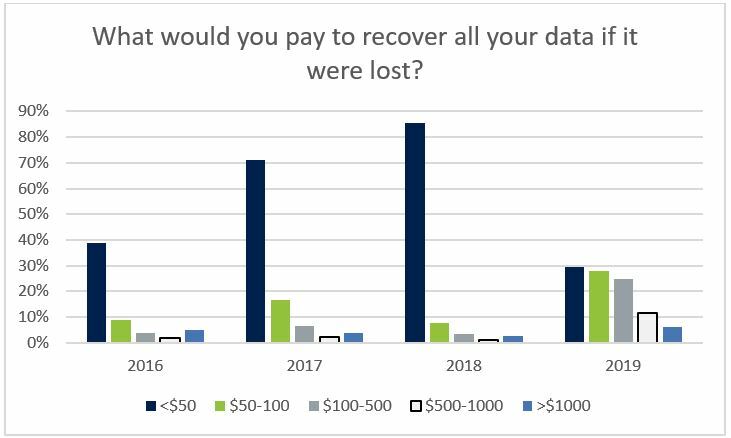 With so many more people having personal experience of data loss, it only makes sense that this year’s respondents offered a historically diverse answer to what they would pay for recovery. In our past surveys, the vast majority of consumers placed a recovery cost of less than $50 as their breaking point. In 2019, however, the percentage of respondents in this bracket fell by an astonishing 56.2 percent. 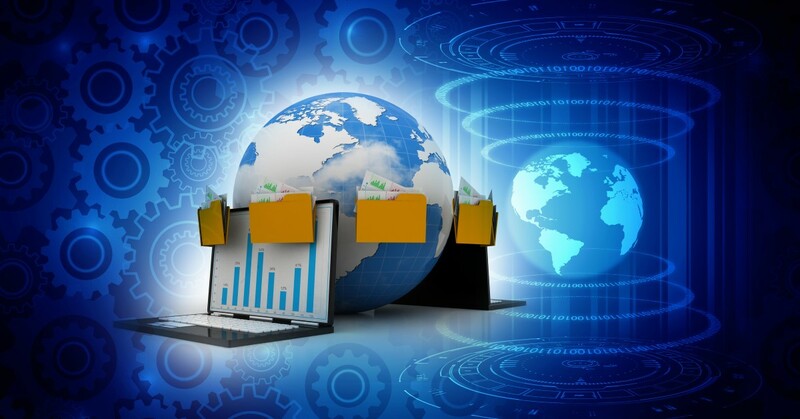 At the same time, 20.2 percent more respondents valued their data at between $50-100, 21.5 percent more valued their data at between $100-500, 10.8 percent more valued their data between $500-1,000, and 4.4 percent more valued their data above $1,000. As their daily reliance on data continues to rise, it would seem the value they place on that data is increasing as well. Through four years of survey results, Acronis has an inside look into the shifting habits, priorities, and experiences of personal technology users. These findings illustrate a global audience that’s very aware of the importance of their data and the challenges – both malicious and accidental – that threaten its safety. While this growth in awareness is positive, the enormous jump in data loss experiences indicate that it may not be happening fast enough. Now more than ever, it’s key for technology users to be aware of the threats that face them and actively work to defend against them. 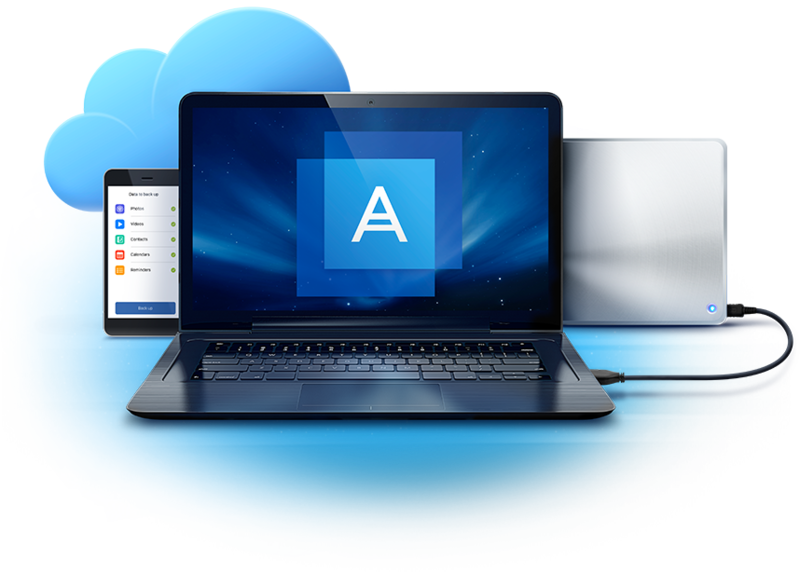 Best practices like the 3-2-1 rule of backup and innovations in cyber protection found in Acronis True Image 2019 help to ensure that any user – from the most casual to the most digitally savvy – can protect what matters this World Backup Day and beyond.